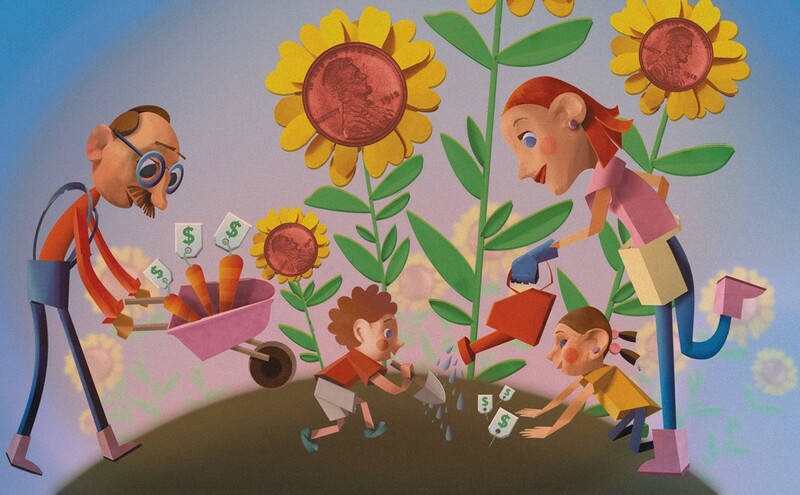 On the Cheap: How to Raise a Family on a Budget | Features | Kids VT - small people, big ideas! Starting a family means creating your own traditions — a favorite playground or picnic spot, or a beloved song you sing in the car. Each family also develops their own economic plan. How much will you spend on groceries each week? On winter gear? Home decorating? Clothing? Family budgeting is often approached with dread or uncertainty. In his book, Saved: How I Quit Worrying About Money and Became the Richest Guy in the World, Vermont writer Ben Hewitt humorously acknowledges his fear of family finances. "I am bothered by the fact that for the majority of my adult life, I have fretted over money. And then, ridiculously, I fret over my fretting." To lighten the burden, we asked six local pros to share their money-saving savvy — and tossed in a few tips of our own. Here's to fretting less and focusing on what really matters: raising children. Hannaford dietitian Brigitte Harton's number one tip for tackling the grocery bill: create a meal plan. With 23 years of experience, Harton knows a lot about the subject. "Don't reinvent the wheel," Harton says. Make a general weekly plan to use as a template, tweaking it as needed. You're not going to create 365 original dinners each year. Ask your kids to participate in menu planning; they're more likely to eat meals they've requested. Consider your family's schedule. Soccer-practice or dance-lesson days are good opportunities for "planned-overs" — nights when you raid the leftovers — so you don't resort to the expense of eating out. Harton suggests using unscheduled evenings to cook large quantities. That leftover roasted chicken will give you a head start on a "planned-over" taco dinner. A shopping list is key. Inventory what you need, then keep to the list to eliminate expensive impulse buying. Go vegetarian — or semi-vegetarian. Meat is a pricey ingredient that can be reduced in many recipes. For example, when stir-frying, add more vegetables or beans. Less meat is better for your bank account — and the environment. Shop deals and sales, but be savvy. Don't use coupons for items you wouldn't otherwise purchase. My Hannaford Rewards offers cash-back incentives to purchase Hannaford brand products. Other stores offer similar money-saving programs. Healthy food doesn't always come from the produce section. If fresh veggies and fruits aren't feasible for your budget — or are out of season — check out canned, frozen and dried options. Shop for vegetables with no salt added and fruit canned in its own juice rather than sugary syrups. Buy or barter locally. Vermont farmers produce a bounty of vegetables, meat, cheese, honey and maple syrup. Consider buying in bulk directly from a farm and stocking your freezer with chicken or berries. Grow a garden. Even a small bed of greens offsets the grocery bill, and what could be healthier and more satisfying than produce plucked from the backyard? Best-selling writer John Cheever famously quipped, "Writing fiction is not a competitive sport." Parenting isn't, either — something to bear in mind when planning a child's birthday party. Nicole Howard and Raelyn Ward of Whim of Whimsy, a Cambridge party planning and décor rental company, offer some tips for birthdays on a budget. Howard and Ward emphasize that, for kids, birthday cake is good cake. Box cake mix is perfectly acceptable. "Even the most terribly frosted cake, done with love, will be better — and cheaper — than a grocery store cake anytime," they say. Or, offer decorate-your-own-cupcakes as part of the festivities. Timing matters. If you throw an afternoon party, you can offer snacks and cake — but don't have to provide a full meal to guests. Don't blow your budget on the venue or a party package. Take a small group ice skating, bowling or to an open gym and skip the expense of a party room. In the summer, set up in a favorite playground or on a local beach. Many parks have shelters available for little or no cost. Party décor doesn't have to break the bank. Tape or hang colored balloons or leave them on the floor. If you're feeling fancy, draw animals or pictures on the balloons with Sharpies. Twist streamers to make a fancy backdrop — like seaweed for a mermaid-themed party — or hang them like a curtain. Go digital — and not just for invitations. The internet is a gold mine of decorating ideas, many available as free downloads. "Print screen grabs of characters if your child absolutely has to have that princess or cartoon character, and tape it to a birthday banner you already own, a wall or onto a basic plastic tablecloth," Howard suggests. Be kind to the planet — and your wallet — and nix the tiny plastic favors that will likely get tossed in the garbage. Plan a DIY craft that doubles as a take-home token. For the little ones, even a balloon on a stick is fun. Opt for simplicity. If your child is turning 1, consider inviting family and friends to a picnic. Bring the cake, plates and utensils and ask guests to contribute a potluck dish. Choose a venue with a vista. My good friend's son had a birthday tradition of hiking up Mount Elmore. While the parties afterwards have mostly faded from memory, we still remember those hikes — the rain, the mud, the view — and I'm sure her son does, too. Get creative when planning recreational and cultural outings with your kids. Vermont boasts a variety of state parks — all family-friendly. In addition to swimming, camping, fishing and playgrounds, many offer free concerts, storytelling and naturalist programs. Rochelle Skinner, sales and service manager for Vermont State Parks, gives these tips to maximize good times while minimizing expense. A $30 punch card provides families with 10 visits at a discounted price. A $90 vehicle season's pass includes admission for up to eight passengers to all parks; purchase a second pass for $50. All Vermont public libraries have one-day free park admission passes available for checkout. The First Time Happy Camper program, offered at five state parks, includes a free campsite for two nights, loaner equipment and friendly ranger advice for camping newbies. Vermont State Parks' Venture Vermont is an outdoor challenge with a reward of a free park pass good for that season and the following year, too. Swim at public beaches. My family's favorite is Caspian Lake in Greensboro — shallow and perfect for small children. Explore a local trail system. While some require a small fee — Burke's Kingdom Trails is $7-15 and free for kids under age 8 — others, like the Lamoille Valley and Missisquoi Valley rail trails, the Stowe Recreation Path, and the Burlington Greenway Bike Path are free. In Huntington, the Green Mountain Audubon Center opens its five miles of trails to the public for a donation. Visit your local library. It likely has museum or historic site passes for free or reduced admission. While you're at the circulation desk, check out the library's programming. In addition to story times, libraries often host fun events, from puppet shows to crafting sessions. Check out low-cost or by-donation performances put on by community theater troupes and schools. Know when to splurge. After a hot hike, stop for ice cream sundaes as a sweet reward. Does your house need a springtime spruce up? Burlington mom Jillian Kirby, who writes the lifestyle blog Hey Jillian, suggests starting small. Children's rooms are "perfect places to flex your DIY muscles," she says. Because they're not the family's main living spaces, the stakes are lower. Plus, children's preferences often change every few years. Kirby's practical tips center on affordability and creative expression. Fresh paint is a budget-friendly way to brighten up a space in a short time. But be cautious with color, Kirby advises. "You don't want to be stuck repainting a whole hot-pink or neon-green room in a couple of years," she says. Instead, focus on a single wall if you want to experiment with a brilliant hue or a playful mural. That way, when your little girl turns into a tween who's no longer in love with cotton-candy pink, repainting won't make you pull out your hair. Budget-priced new furniture is often poorly constructed and surprisingly pricey. Cruise Craigslist, Facebook Marketplace or Front Porch Forum for used, solid-wood items. "Even the most dated dresser can turn into a creative, one-of-a-kind piece with some new hardware and paint," says Kirby. Decorative accents are a good way to create a unique space. Add whimsy and excitement with fun wall art and colorful or patterned window treatments and throw pillows. Even amateur seamstresses can stitch pillowcases, curtains and duvet covers in creative prints. Hang a wall of inexpensive matching frames with photos or prints of your kid's current favorite characters. Use a regular office printer, so you can swap out SpongeBob SquarePants or Peppa Pig when a new infatuation comes along. For DIY inspiration, Kirby recommends spoonflower.com and designsponge.com. New parents often bemoan the amount of stuff kids require — including clothing. Anya Huneke, owner of Burlington's Dirt Chic consignment shop, points out the wisdom of shopping secondhand. "Kids grow through — and wear through — clothes so fast," she says. Their tastes change, too. Buy ahead, Huneke advises. Her advice applies not just to anticipating upcoming seasons, but larger sizes, too. Your kid isn't going to wear a 2T forever. If you see a great price on a 3T snowsuit, assume it will be used. "Don't waste a good deal," she says. Invest in the practical, "concentrating on stuff that's about play," Huneke says, since those clothes will get the hardest use. Focus on sweatpants, T-shirts and slip-on shoes, rather than fancy get-ups and lace-up shoes. Buy unisex clothing, so that everyone in the family will be satisfied with hand-me-downs. Repair what's worn out. If you don't have simple sewing skills, consider learning to replace lost buttons and stitch small rips. Repurpose outgrown or no-longer-loved clothes. Huneke cuts leggings into shorts for her daughter to wear beneath skirts. Establish a swapping system with fellow parents. That way, nothing goes to waste and everyone wins. Last, Huneke acknowledges, she's gotten "a lot of rags out of my kids' clothes." That's useful, too.